Exercise Psychology-2nd Edition 2 Edition "Exercise Psychology, Second Edition," addresses the psychological and biological consequences of exercise and physical activity and their subsequent effects on mood and mental health. Like the first edition, the text includes the latest scholarship by leading experts in the field of exercise adoption and adherence. 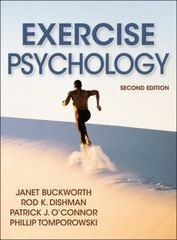 This edition also incorporates research on lifestyle physical activity to reflect this growing area of study over recent years.In contrast to other exercise psychology textbooks grounded in social psychology, "Exercise Psychology, Second Edition," presents a psychobiolocal approach that examines the inner workings of the body and their effects on behavior. From this unique perspective, readers will learn the biological foundations of exercise psychology within the broader contexts of cognitive, social, and environmental influences. By exploring the biological mechanisms associated with individuals' behavior, "Exercise Psychology, Second Edition," challenges students and researchers to critically examine less-explored methods for positive behavior change.To reflect the continued growth of information in exercise psychology since the first edition was published, the second edition of "Exercise Psychology" offers the following new features:- Three new chapters on exercise and cognitive function, energy and fatigue, and pain- Thoroughly revised chapters on the correlates of exercise, neuroscience, stress, depression, and sleep- An image bank featuring figures and tables from the text that can be used for course discussion and presentationAuthors Buckworth and Dishman, along with newly added authors O'Connor and Tomporowski, bring subject area expertise to the book and provide an in-depth examination of the relationships between exercise and psychological constructs. The findings on both classic and cutting-edge topics are clearly and cohesively presented with the help of relevant quotes, sidebars, suggested readings, and a glossary to guide students through their studies. "Exercise Psychology, Second Edition," provides an in-depth examination of the psychological antecedents and consequences of physical activity, helping readers understand the mental health benefits of exercise as well as the factors involved in exercise adoption and adherence. Thoroughly revised and updated, the second edition of" Exercise Psychology" balances the biological foundations of the brain and behavior with theory and knowledge derived from behavioristic, cognitive, and social approaches.